ORMISTON Park Academy, in Aveley, was delighted to host the hugely successful Women in Science and Engineering (WISE) ‘People Like Me’ workshop for the second year in a row this month. The event, which welcomed 40 female students in Years 7 to 11 who demonstrated excellent progress in Science, alongside a female family member, was aimed at improving women’s representation in Science, Technology and Engineering (STEM) subjects and careers. The academy, which is sponsored by Ormiston Academies Trust (OAT), teamed up with Sarah Thacker, Silver Chan and WISE to organise and deliver the workshop, a social enterprise which campaigns for gender balance in STEM industries. The session started with a personality quiz for students to identify what type of scientist they would be and to discuss their skillsets and potential career-paths. Female ambassadors from local and national STEM organisations, including a Design Technology Manager from Network Rail, a graduate engineer at Transport for London and a senior scientist, attended to share with students their inspiring career paths. After a Q&A session, the representatives, along with university students studying degrees in Project Management, Psychology and Computer Science, spent time with each group of students and parents to share their experiences. Additionally, Sam Bailey from Make Happen, the National Collaborative Outreach Programme funding partner of the academy, provided a session on student finance options for those interested in STEM degrees to all parents. As part of wider STEM-focused efforts, Ormiston Park Academy also hosted a ‘Hackathon’ competition, giving 30 high attaining female students from Years 7 to 10 the chance to design and create their very own STEM websites using specialist coding techniques. 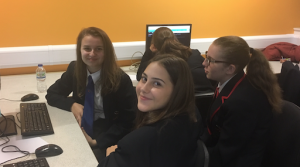 Delivered by the Stemettes – another organisation which encourages girls aged 5-22 to pursue STEM careers – the session saw students team up to work on and present their websites. Kamila Kozlova and Alicja Rembecka were thrilled to win the Stemettes award and receive a trophy and prize. Ormiston Park Academy is committed to ensuring that all students have the opportunities to fulfil their potential – whatever their background or starting point. The series of STEM events, aimed at female students in particular, is part of the academy’s vision to raise students aspirations and broaden horizons. “We were so proud to see such a high level of enthusiasm and engagement from our female students at these two fantastic events, aimed at inspiring and instilling confidence. Encouraging more females to consider STEM degrees and future careers in related industries is something that we are hugely passionate about at our academy and we know a great deal of work is being done across the country to drive this also.